Photography and comments by Ray Maloney. This article recently appeared on CNN. It talks about he cooperation between the US and China during WWII. 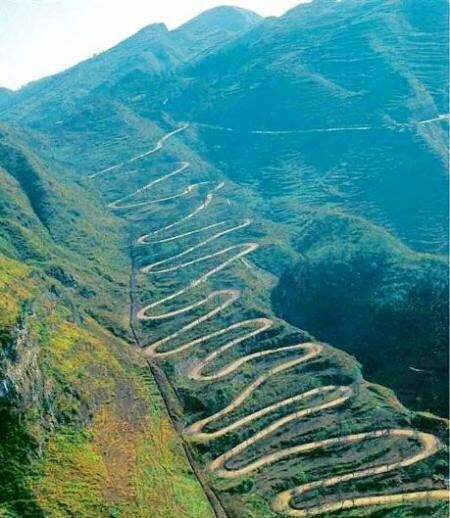 There is a certain Guizhou Road that took a lot of American traffic, resupplying the Chinese in the fight against Japanese aggression. For an update on my tuberculosis, the public health department doctor I met with in October in Phoenix, AZ said he thought it was about a 25% probability I had tuberculosis. There was definitely an anomaly in my lungs that looked liked TB, but with the various skin, sputum and blood tests all being negative for TB, he said it could be another bacteria causing it. Fortunately it seemed that whatever it was did respond to the TB drugs, so he kept me on them. My six month course of first four TB drugs, that dropped down to two after a couple of months (the two that were stopped were good at dealing with the TB bacteria that had developed drug resistance, but one was bad for the liver and the other bad for the eyes). My TB medicine therapy will be complete in mid January. Interestingly, in Phoenix a person came out to my home twice a week to give me these TB medicines and observe that I swallowed them. Expensive administratively, but they said that in the big picture it was better than having patients stop taking the meds, which would be harmful to them personally and to society at large. Compliance. As for my work, I’m now a teacher in northeast China at the Harbin Institute of Petroleum. So instead of doing 12-15 year old middle school kids like I did for two years in Guiyang, I’m back to doing 18-22 year old college students. Gosh, they’re tall here. Especially after Guizhou. Interestingly, the petroleum majors’ English is better than the English majors. It took higher scores on the college entrance test to get into the petroleum department than into English. It was kinda a shocker to me in late August when I found it quite hard to find a job in Harbin (I was following a friend who is in college here). But then, I was on a tourist visa, had the TB thing, had a teacher’s certificate but not a TESOL degree, and was old—57 years old. Importantly, too, there were changes in policy: To change that tourist visa back to a work visa I had to return to my home country and apply for it from there. Unfortunately a trip down to Hong Kong to change an L tourist visa to the Z work visa doesn’t work now. So I had to spend the money on a trip back to the US. It was a nice chance to spend time with my parents in Phoenix. But my students in Harbin had me only for the beginning of the semester in September and early October, and then for a couple of weeks in December at the end of the semester. What I thought would take six weeks at the most to get the visa stretched to seven weeks, and the return date for the cheap ticket I bought couldn’t, it turned out, be changed to a later one (bad China Southern Airlines). So a friend bought me (then broke) a ticket back to China. In fact, I almost couldn’t even get the work visa again because my employer in Guiyang during my second year of employment had put me into one of the schools they managed that didn’t have the right to employ a foreign teacher. Such illegal employment is now supposed to make it impossible for foreign teachers to ever get the work visa again. Anyway, everything has worked out and I’ve done a semester at this college and am on their paycheck (well, direct deposit) for the winter vacation. I’ve got my new passport (I had to renew it after ten years), and my work visa and residence permit should all be done by mid January. My stuff in Guiyang is secure thanks to your [Jack Porter’s] efforts and financing, and yesterday I paid back rent for my place in Shanghai. The day after tomorrow I leave for a January-February stay in Shanghai—the dorms in Harbin are totally empty during the school’s long winter vacation (from yesterday the room got much colder, and they’d charge me if I stayed the whole winter break here). Unfortunately with the crackdown on foreign teacher’s employment, I can’t work for any other schools during this two month vacation, or do any part-time teaching at a school once the new semester begins. Whether they’d catch me and expel me for paid private tutorial classes at a student’s home is unsure. So I’ll have to make due with the 7,000 per month (6,880 after taxes) I get each month. But much of my energy now is going into learning Chinese. I hope to pass the HSK-6 this June—I’ve failed on this test twice 🙁 . And, thinking ahead for when I hit my 60s and may find it hard to find work as an English teacher in China (though maybe I could still work as a teacher in Taiwan), I may use this better Chinese to do something else here in China (business?) or in the US (work in an NGO dealing with China?, teach Chinese in an American K-12 school?). I could also be a social studies teacher again in the US, or in an international school abroad. Or maybe I could go somewhere in South Asia (India, Pakistan, Bangladesh—my Master’s degree concentration was in South Asia and in 1991 I did three months each of language study in Varansi / Banaras, India and Lahore, Pakistan). Applying for a work permit/visa in China and need your criminal background check letter fast? We've got you covered. For the China work permit regulation, a letter from any level of government—city, state, or federal—stating that you have no criminal record seems to do. Some provinces do not require an original copy—a scan suffices. Thus, the easiest solution, if your most recent city of residence allows it, is to send a friend or relative to the local police station there and request the letter and then scan and e-mail it to you. However, some police stations require the signature of the person whose background they are checking; others require a notarized signature. The U.S. consulate in Chengdu provides notary services for a fee of $50, but you must book an appointment during citizens' services hours, which might not be available immediately. Still other police stations require such requests be made in person. Print two to five copies of the FBI fingerprint card (link opens PDF). This must be printed in color on cardstock. Obtain fingerprints on these cards. The U.S. Consulate lists fingerprinting agencies in Kunming and Chengdu, and here is the FBI's advice on taking clear fingerprints. Fingerprints must be done in blue ink. Taking up to five sets is advised in case some prints are rejected. Here is complete information on how to fill out the information on the fingerprint cards (link opens PDF). Here's the expedited part: Select an FBI channeler from this list of FBI-approved channelers. Select the appropriate delivery method (as of this writing, a scanned copy suffices for the Chengdu Human Resources and Social Security Bureau, so to save time, select an option that includes receiving the letter via e-mail). If you also choose to have an original copy of the letter mailed, make sure to provide a U.S. address and have it sent to your name. Select your desired payment option (this might require printing and completing a credit card payment form). c You can e-mail the channeler to notify them that your request is on its way. Use an express courier to send your application form, fingerprint cards, and payment to the channeler you selected. As of this writing, FedEx's fastest service takes about 3 days from Chengdu to Chicago and costs RMB310. DHL charges approximately RMB440. Track your package online and wait with baited breath. After the designated processing time (48 hours in the case of Accurate Biometrics), you will receive an e-mail with a one-time access link to download your letter in PDF form. Therefore, make sure you are downloading on a device that will allow you to save the file. Note: The above method takes about one week in total and costs around $100 to $150 (express shipping plus channeler fee). If you have more than a month to prepare this document, you can submit your request directly to the FBI. The fee for each "identity history summary" (i.e., criminal background check) is $18, and the processing time is 32 days. You will still need to factor in the cost and time of shipping your application and fingerprint cards to the FBI. foreign nationals have no criminal record in order to work legally in China (无犯罪记录证明). While enforcement of the general regulation may be handled differently in other cities, the Chengdu Human Resources and Social Security Bureau requires new arrivals and job changers to provide proof of no criminal record before a work permit will be issued. While it is not clear if entries for minor crimes may be tolerated, the rule of thumb seems to be zero tolerance. Disclaimer: This information is based on the process I went through in 2011, 2012, 2014, and 2015 to obtain my FBI background checks for international immigration. It is not legal advice. It is not necessarily up to date. Official processes change at random and are unpredictable. Check with the FBI for the most up to date advice. When you move abroad as much as I do, you get really, REALLY good at being fingerprinted. I’m not an international mastermind criminal; I just have to prove that I have no criminal record all the time. For most working visas and a handful of student visas, a national criminal record check is required. For those who live outside the USA, this can take a whopping two days. Rather unfortunately, for those of us who are form the USA it’s a lot more complicated to get an Identity History Summary. To be clear, 14-16 weeks is more than three months. With mailing, closer to four and a half. Plan accordingly. If you want to be in Korea by October or earlier this year, you’ll need to apply now. Be aware of how many checks you’ll need! In Korea, you typically need a check for your visa and one for the Education Office. A set of official fingerprints for each check you need, taken at your local police precinct. Mine cost $11 each. The Applicant Information Form, completed in block capitals and black ink. Download it here. A method of sending these items with a tracking number to the FBI in West Virginia. NEVER send without a tracking number. Submit all of those things, and wait. And wait. And wait. You can try calling the FBI and pleading with them to speed up the process, as I did on my lunch break in 2011. It won’t do any good. They won’t even necessarily know whether they’ve received your application or not (and this was three months in). Check your tracking number, and watch your bank account for the charges. Eventually, you will get a very plain envelope in the mail with a record check in it. The check itself will look something like this. Even though it says that this check is no good for employment, pay no attention. They mean employment in the USA. The most important things are the signature and stamp, and the Result stating ‘no arrest history.’ You can now send this to your prospective university, employers and/or recruiter and get going on the actual visa process. You may notice that there is an option to pay a company to run the background check instead of the FBI. In fact, these companies are approved by the FBI and listed on their website. In a pinch, it is possible to apply through these companies but you need to keep two things in mind. #1- Channeler checks may NOT be accepted for apostilles or official use by immigration offices. #2- Channeler checks cost a lot more to process, even though they are faster. I applied for one just in case we need a backup location and end up in Korea this year, and the whole process took about a ten days. Make certain that you ask the consulate or embassy to which you will apply for your visa BEFORE assuming a channeler check will suffice. FBI-approved Channelers receive the fingerprint submission and relevant data, collect the associated fee(s), electronically forward the fingerprint submission with the necessary information to the FBI CJIS Division for a national Identity History Summary check, and receive the electronic summary check result for dissemination to the individual. An FBI-approved Channeler simply helps expedite the delivery of Identity History Summary information on behalf of the FBI. The process for making a request through an FBI-approved Channeler is consistent with FBI submission procedures. Please note that an FBI-approved Channeler may have different methods or processes for submissions. Furthermore, additional fees may apply above the FBI fee for requests submitted through an FBI-approved Channeler. Contact each Channeler for processing times. Under Departmental Order (DO) 556-73 An individual may obtain a copy of his/her FBI criminal identification record, upon request, for review and correction purposes, to challenge the information on record, or satisfy certain legal requirements such as a requirement for adopting a child; requirement to live, work, or travel in a foreign country; and/or other court-related matters. A DO request cannot be submitted for employment and/or licensing purposes within the United States. National Background Check, Inc. (NBCI), one of only a select few companies within the United States to be awarded FBI Channeler status, has the capability to accept fingerprints on cards for an individual wanting a national fingerprint-based check on themselves through the FBI. 2. Your fingerprint card (FD-258) - can be downloaded from our FBI Channeling application (see section 1). 3. Payment of $50 (per person) can be made in Check or Money Order - made payable to NBCI or by Credit Card (exception - Discover). **Please note: The $50 processing fee is non-refundable once the application is processed. If fingerprints are rejected by the FBI, we will make a second submission on your behalf, free of charge. If fingerprints are rejected a second time, you will need to send a new processing fee of $50 and 2 new sets of fingerprint cards. · An FBI-approved Channeler may only process requests for a U.S. person (an individual who is a citizen of the U.S. or a lawful permanent resident of the U.S.). · An FBI-approved Channeler cannot process a request for employment and/or licensing purposes within the United States. This type of request should be coordinated with the appropriate state identification bureau (or state police) for the correct procedures. · Fingerprints MUST be captured by a law enforcement agency or FBI- approved Channeler. An individual is not permitted to capture his/her own fingerprints on fingerprint cards. · All FBI Channeling results must be sent back to a US address. Results are prohibited from being shipped overseas. Fingerprinting on Cards: FastFingerprints, a National Background Check, Inc. company, can capture electronic fingerprints and then transfer the images to a fingerprint card (FD-258). This fingerprinting process is superior to the ink method and greatly reduces the risk of rejected fingerprints. These fingerprint cards can be used to obtain an Arizona Fingerprint Clearance Card, to apply for an out of state license, or to obtain an FBI Background Check through our FBI Channeling service. Click Here for the locations and hours of operation. Beijing, Qingdao, and Hangzhou have announced that certain foreign workers will need to submit a “certificate of no criminal conviction” (CNCC), also known as 无犯罪记录证明 or police clearance letter. The 1996 Rules for the Administration of Employment of Foreign Nationals in China require that foreigners seeking to work in China have “no criminal record” (art. 7). However, neither those rules nor the country’s new Exit-Entry Administration Law specifically require a CNCC. Some cities, such as Suzhou, Nanjing, Chengdu, Wuhan, and Changsha, as well as the province of Yunan, previously put CNCC requirements in place. Shanghai has not. But other cities may be developing such requirements. Employers should plan ahead to apply for such certificates because timing for issuance may vary. Our law firm can assist with this matter. 3. Persons who hold a “foreigner’s work permit” (就业证) or “foreign expert certificate” (专家证) issued in another city seeking to transfer employment to our city. 2. A certificate of no criminal conviction authenticated by a Chinese Consulate. Essentially the same information is included in the Bureau’s 企业办理外国人就业许可相关事宜 (Matters Concerning Enterprises’ Applications for Employment Licenses for Foreign Nationals), also updated June 4. Note that no new CNCC is required to renew or amend a work permit. For applicants from the U.S., any of the types of CNCCs listed below in Q2 should suffice. (QMBHRSS) has announced in its Guide to Service for Foreigners Coming to Work in Qingdao (外国人来青就业服务指南) that what is required is an “original certificate of no criminal conviction notarized by one’s own country and authenticated by a PRC consulate abroad (with an attached Chinese translation, including the translation company’s official seal).” This must be submitted at the employment license (就业许可) application stage or, for a person seeking to work at a representative office, at the work permit (就业证) application stage. A certificate is needed for individuals who have previously worked in other cities in China. But no certificate is needed for changing work units within Qingdao. For applicants from the U.S., QMBHRSS has stated orally that the only acceptable format for a CNCC is an FBI Criminal History Check. For applicants from the U.S., the Public Security Bureau does not require any specific format for the CNCC, although they have recommended orally that it be nationwide in scope rather than covering just one state. (An FBI Criminal History Check is acceptable). We have received notice from higher-level authorities that, effective today, foreign nationals applying to our Bureau for employment licenses (就业许可)–including persons already holding Z visas but applying for work permits (就业证) for the first time in Hangzhou, and including people coming from abroad–should submit a certificate of no criminal conviction. According to the “Rules on Management of Foreign Nationals Working in China,” foreign nationals applying for employment licenses should submit a certificate of no criminal conviction. Our Bureau will be strict on this point in examining and approving applications. Inconvenience or business needs of a work units or individual will not be grounds for waiving this requirement. While the Bureau doesn’t specify which agency must issue the certificate, the Bureau has confirmed orally that it must list any convicitons nationwide (not just within a state or province) and it must be authenticated by a Chinese consulate. Q1. What if the place abroad where the applicant “resides” is not his or her country of nationality? The Beijing announcement asks for the certificate from the individual’s “place of residence,” not country of nationality. The announcement doesn’t define “place of residence,” and are unclear about whether a China CNCC could be acceptable. I’ve been told orally that a China CNCC is acceptable instead of a foreign CNCC if the applicant has lived in China for 9 months each of the most recent 3 years preceding the application. In such cases, the China CNCC must be accompanied by (a) a declaration from the applicant that he or she has not been convicted of a crime and won’t commit a crime in the future, and (b) a letter from the sponsoring work unit, if the applicant already works there, stating that to their knowledge the applicant has no convictions. Since there is no written rule, the best practice is to confirm directly with the Beijing HRSS whether this would be acceptable in your particular circumstances. Qingdao’s Municipal Bureau of Human Resources and Social Security more ambiguously requires that the notarization be done by one’s “own country.” Qingdao will not accept a China CNCC. Q2. What forms of the certificate of no criminal conviction are issued in the United States? FBI:An FBI criminal history summary check (“rap sheet”) requires submission of fingerprints. Fingerprinting options include, but are not limited to, being fingerprinted abroad or by a “channeler” in the U.S. Typically, U.S. Embassies and Consulates abroad don’t assist with fingerprinting for purposes of obtaining a CNCC. But the S. Embassy in Beijing and the U.S. Consulates in Shanghai and Chengduhave posted instructions for how to get fingerprinted by local PRC agencies. A completed fingerprint card can then be submitted to the FBI (processing takes 5-6 weeks) or to a channeler (processing takes 1-2 days). State and local law enforcement authorities:Each has its own procedures for requesting a certificate of criminal conviction. Some require fingerprints, and some require the applicant to apply in person. For state-level contact information, see the FBI’s list of State identification bureaus. Court:Courts can issue a letter stating that a search of their records shows no conviction. Q3. What forms of certificate of no criminal conviction do other countries besides the U.S. issue? Here’s a list of methods for getting a CNCC from various countries. It’s published by the U.S. State Department. It’s not all-inclusive. Q4: When does a CNCC need to be authenticated? What’s the procedure? Authenticating a foreign document simply means confirming that a signature, seal or stamp appearing on the document is genuine. Authentication in no way attests to the truthfulness of the contents of a document. Qingdao requires that all CNCCs be authenticated. Beijing requires authentication only if the CNCC isn’t from a public security agency (i.e., local or state police or the FBI) or a justice authority (i.e., a court or prosecutor). To authenticate an FBI criminal history summary check, it must be submitted to the State Department and then to the PRC Embassy in Washington, DC. Basic information about authenticating other types of documents is outlined in the PRC Consulate in Los Angeles’ instructions for authentication. Q5: Will any conviction–or just certain convictions–render a person ineligible for an employment license? The Ministry of Labor’s Rules for the Administration of Employment of Foreign Nationals (1996) specifically say that an employment license applicant must have “no criminal record” (无犯罪记录). (Art. 7). That makes it sound like any criminal conviction will make a foreign national ineligible for an employment license. Revised Ministry of Labor rules touching consistent with the new Law may be released, perhaps in the near future. Another question is whether all foreign convictions–or only convictions that fall within the PRC Criminal Law’s definition of “crime”–render a person ineligible for an employment license under the Ministry of Labor’s rules. The PRC Criminal Law defines crime as any act that endangers society and is subject to punishment. An act is not a crime, however, if it is “obviously minor and the harm done is not serious.” (Art. 13). Unlawful acts that don’t amount to crime are defined by administrative laws and regulations, punished by administrative organs according to administrative procedures, and subject to administrative penalties. For example, PRC law distinguishes between the “crime” of driving with a blood alcohol content at or above 0.08% versus driving with a BAC of at least 0.02% but under 0.08%, which may subject a person to administrative penalties. In contrast, in California, a person under age 21 or a commercial driver can be convicted of DUI with a BAC under .08%. So is that person ineligible for an employment license in Beijing on the basis of having committed a “crime” in California, or eligible on the basis that the activity doesn’t constitute a “crime” in China? Another example of activities that don’t constitute crimes in China is activities that result in the administrative penalty of reeducation through labor, which may include instances of drug addition, prostitution, illegal gambling, public indecency, and petty theft. Finally, expungement and other post-conviction relief in a foreign jurisdiction may allow an individual to state he or she has never been convicted and to obtain a CNCC. If hypothetically the Chinese government were to learn of the conviction, it’s unclear whether the Chinese government would use the “erased” conviction as a basis to deny a visa or other immigration benefit. In practice, local labor bureaus and foreign expert bureaus may be willing to approve cases where they perceive a prior criminal conviction to be minor, the applicant to have been rehabilitated, and/or the applicant to be especially talented.